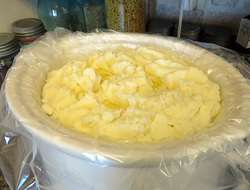 A great way to prepare potatoes ahead of time so that you don't have to try to mash them while trying to get everything else ready for your dinner. 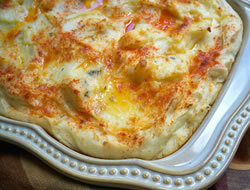 Your will love these delicious mashed potatoes. Boil potatoes until done. Drain and mash. Whip in cream cheese and sour cream until fluffy. Add milk if necessary (not even 1/4 of a cup). 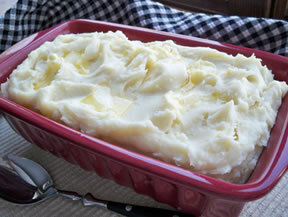 Before baking, preheat oven to 350 degrees F., drizzle melted margarine over the top. Bake 1 hour (40 minutes covered and 20 minutes uncovered). Or, place in a slow cooker on low and heat for 4 hours before serving. You could also bake them in the crock in the oven before hand and keep them warm in the slow cooker until ready to serve. 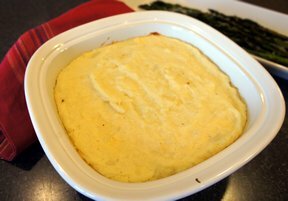 "For anyone that has to make holiday meal, you have to try these mashed potatoes. Take the stress off yourself of having to mash potatoes when you are trying to get everything else prepared for your meal. Don't be afraid of the sour cream and cream cheese in the recipe. I was leery at first that they won't taste right with gravy but they tasted great. You have to give them a try."